Funerals traditionally have flowers as a mark of respect and mourning. Sending flowers via our network of local florists ensures your sympathy flowers will get personal attention even when you can't attend in person. The loss of a friend or loved one can bring long periods of grief and mourning. It is at this time that support needs to be shown for the ones left behind. 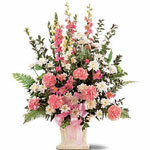 Convey your feelings of sympathy by sending flowers to the funeral, wake... or during the lonely weeks after. Funeral flowers can be styled as funeral sheafs, funeral wreaths, and a host of other designs like funeral pillows, coffin covers, casket sprays and funeral arrangements that convey your respects in the manner you would wish. Some designs are quite complex and are therefore more expensive. Choose from those on offer above. Given adequate notice, your local florist can usually deliver to a funeral service. When ordering, make sure you give the name of the deceased person (e.g. The Late Mr Smith) and the time of the service (e.g. 10AM service) so the florist is aware of the timing. It is also fairly common to request flowers be delivered to the home of a close family member if you happen to miss the burial service or are not sure where it is being held. However, we strongly encourage you to carefully consider whether to send flowers to the home after the service in case it re-opens the grieving process for the family. Florists are regularly asked to deliver flowers to a particular grave site; perhaps on the anniversary of the death. This is often possible but, because some cemeteries are very large, it can sometimes be a challenge. 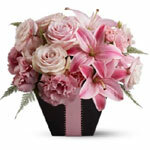 Consult a local florist at Petals Florist Directory for more advice. 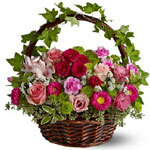 For a wider range of Sympathy Gifts, please also consult our Sympathy section.